OBS Engine RTA Review - A Small & Simple With Great Performance! Home → RBAs → RTAs → OBS Engine RTA Reviewed – A Great Performing & Simple RTA with a Great Price! 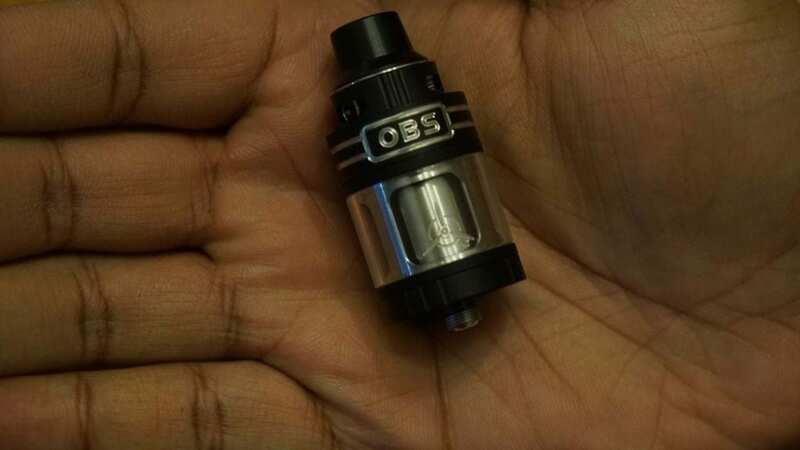 OBS Engine RTA Reviewed – A Great Performing & Simple RTA with a Great Price! Rebuildable Tank Atomizers, also know as RTAs have become increasingly popular over the past year. OBS had released its first RTA last year, which became a favorite of many vapers, and may have been seen as one of, it not the best RTA of 2015. Times have changed though, and there is much more competition in the RTA market than ever before. 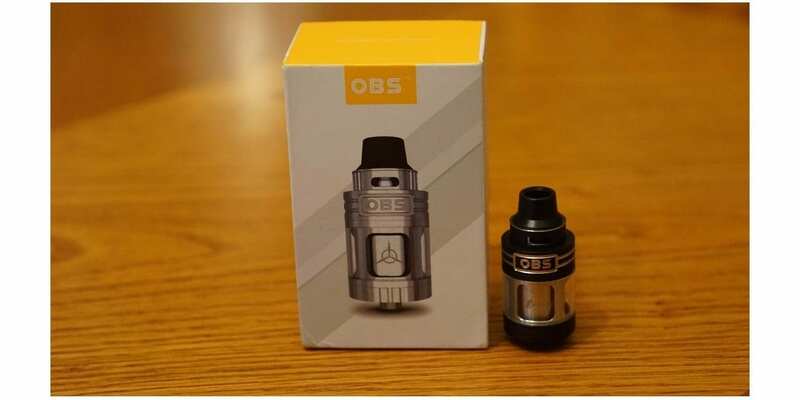 In this review, I will go over my impressions of this tank, building and wicking, performance, cons and conclude by telling you whether or not I recommend the OBS Engine RTA! Click Here to Check Out the OBS Engine RTA! When first receiving the OBS Engine RTA, the first thing I noticed was its rather small packaging. Compared to some of the other atomizers I have received lately, this package was certainly on the smaller side in comparison. This is not to say there is anything wrong with that necessarily, but just something I noticed. The packaging itself is quite simple, and shows a picture of the tank right in the front alongside the OBS name on the top side. On the bottom of the packaging there is a QR code which you can scan, and on the back there is some information about what is included and about the product itself. Also, on the back it states which color tank is inside the packaging, and in my case it is black. Upon opening the box, what I noticed first is that the tank was not securely in place and was moving quite freely inside. This is certainly a con in my opinion, as I do prefer that products come secure so it will not be damaged upon arrival. However, there was no damages or anything wrong with the product I received, so that’s a good thing. Also, what I noticed about the tank at first is how compact it was for a 25mm RTA. Typically, 25mm RTAs are large in comparison. The Engine is much shorter than many of my 25mm RTAs that I currently own, which was a huge pro for me. Of course, this is subjective, and other vapers may prefer a larger tank in general. Additionally, right under the tank lays the replacement glass tank section, and a allen key screwdriver. The inclusion of an allen key screwdriver a nice addition, as many atomizers just include an allen key, but I find this to be much more easier to use. Not to mention, including a replacement glass tank section is always a pro as well! You also receive a user manual, a bag of spare parts, a pair of twisted coils and Japanese cotton. I do think it is a pro that this tank includes some pre-built coils, as some buyers may be beginners, and having an easy way to first start using this tank is great. In addition, the user manual goes over how to wick this tank, making it even more friendly to beginners. The OBS Engine RTA in the black color is absolutely gorgeous. I really like how this tank looks in black. Of course, this is also subjective and you may prefer a silver or stainless steel color, which in this case is offered. Like said previously, this tank is quite compact for a 25mm RTA. I do like the overall design of this tank as well, even though some may not like it. What makes this RTA unique is that it offers adjustable top airflow. Typically, RTAs would feature adjustable bottom airflow, but recently many new RTAs have been released that feature top airflow. This, to me, is a pro since it will reduce the chances of leaking tremendously. The top adjustable airflow on the Engine is a bit stiff, but it still adjusts with no issues. Honestly, I prefer it to be a bit more stiff than loose. The airflow slots are quite large as well, so there is plenty of airflow available. In addition, I do like the feel of the drip tip, even though it is a bit different than what I am used to. It is a 510 drip tip, you can use your own preferred drip tip! This is certainly a huge pro! Right below the airflow is where the top fill is located. This is probably the easiest top fill design to use. You literally just pull the top fill section up, and it reveals a large fill hole. You will have literally no issues filling this tank with any e-liquid bottle. This is once again a huge pro for this tank. Not to mention, it is just smooth to use and has the perfect restriction when opening and closing it. I can literally hold this tank by the top fill, and it will not open. Honestly, this is just a well designed top fill method. The overall quality of the OBS Engine RTA is also very good. I did not notice any issues with the black coating, which is probably a concern with some. In addition, the threading on this tank was solid as well, and everything screwed together smoothly. Honestly, the quality of this RTA is top notch. Also, I do have to mention that there was literally no machine oil on this tank at all. As stated with all my reviews, I do love when an atomizer comes clean out the package. One rinse and one wash with water, and this tank was good to go. Upon taking the tank apart, it reveals the deck section. This tank does feature a velocity styled build deck, making it a breeze to build on! I did notice that wicking this tank is going to be quite different than other RTAs. All in all, my first impressions of the OBS Engine RTA were all great. The build quality was superb, and the design was surely eye appealing. In the next section, I will go into detail about building and wicking this RTA! The OBS Engine RTA features a two post velocity styled build deck, so you know that building and installing coils in this RTA will be a breeze. The deck itself is quite large, and you can certainly fit some bigger builds in here, which is a huge pro. I had literally no issues fitting Claptons and Fused Clapton builds in this deck. I would usually build 2.5mm diameter coils, which is my preferred diameter. However, 3mm ID coils should fit with little to no issues. The hex screws on this tank are also great. I had zero issues with them, and I have put quite a few builds in here. None of them have stripped, or caused me any issues whatsoever. This is a huge pro once again for this tank. Like mentioned previously, wicking this tank is quite different than other RTAs. Since this tank features top airflow, it is different in regards to its wicking design. Firstly, it is not overly difficult to wick this RTA, but beginners may run into issues. What worked best for me is to have cotton barely sticking into the wicking holes. Most of the cotton I would use will sit on top of the wicking hole. The way this is designed is that e-liquid will feed from underneath the build deck area into your cotton which then feeds your coils. If you look underneath the build deck, you can easily see where you cotton is and how much is sticking out of the wicking hole. It is important to have some cotton sticking out, as I found this to be the best way to get this RTA to wick efficiently. If you have too much cotton in the wicking hole, it may not wick as well. However, if you have too little cotton, you will certainly run into flooding issues, and have tons of spit back. Honestly, wicking the OBS Engine RTA is not difficult. If you are experienced with wicking RTAs, then you will literally run into no problems with wicking. However, if you are a beginner, just know that finding a right balance of cotton is always key to wicking any RTA. Finding what works best for you in each RTA is what’s best. All in all, it was a pleasure to build on the OBS Engine RTA. It took no time to have this tank built and wicked, and ready to be vaped, which leads me into the next section, the performance! Probably the most important question about the OBS Engine RTA is how does it perform? Well I can tell you that it performs great! Firstly, I will go over my preferred build and wattage for vaping this tank. My preferred coil build for the OBS Engine RTA is a dual Clapton coil build. The Clapton coil consisted of 24GA Kanthal wrapped over with 36GA Kanthal. The resistance of this build came out to be 0.33 ohm. This is a build that I do know well, and prefer it for many of my RTAs. The preferred wattage for this build was between 60w and 90w. 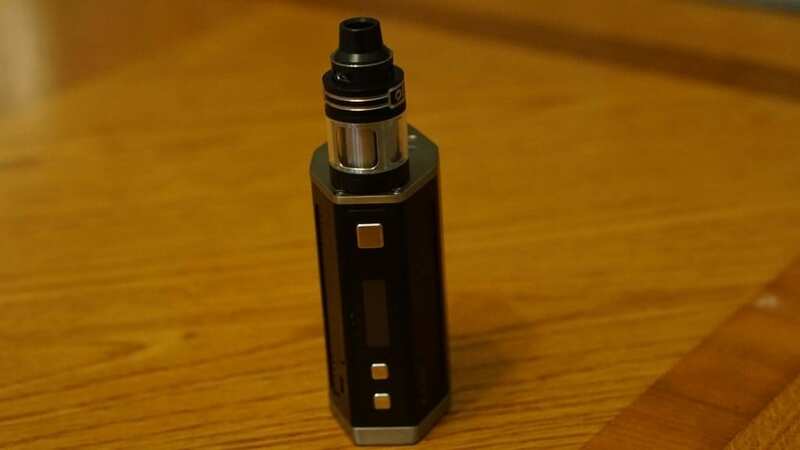 If you plan on replicating a build such as this and vaping at higher wattages, it is important to know and understand what batteries work best for vaping this way. We recently published an article right here about the best 18650 batteries. In this article we list some of the best 18650 batteries for both higher wattages and lower wattages. In addition, we go over some of the best battery chargers and some necessary battery accessories. If you are interested, feel free to click the link down below check it out! Click Here to Check out the Best 18650 Batteries Article! I did try other builds in this RTA, and they worked just fine as well. So if you wanted to just vape this tank with normal round wire builds, it’ll perform just fine! However, with my preferred build and wattage range I received a nice and warm vape. The vape experience was always satisfying from this tank. I do prefer a warmer vape, and more of a restrictive lung hit, so you may like a different build or wattage. The flavor on the OBS Engine RTA is fantastic. The flavor is definitely above average and pretty close to what you would get from an RDA. Honestly, I was very impressed with the flavor I was getting from this RTA. I think the way the top airflow was designed is why this RTA has such good flavor. Typically, I do prefer bottom airflow RTAs, but the OBS Engine RTA might have just changed my mind! The vapor production was also very good. This is by no means a cloud chasing RTA, but you do get great vapor production, especially with a Clapton coil build. The vapor production was certainly satisfying. The airflow was also very smooth with this tank. I never once experienced any type of turbulent airflow from this RTA. Even with the airflow completely wide open, the flavor was still great. I was honestly surprised by this, since many times when you open the airflow of any tank, the flavor comes down a lot, but the flavor was still solid for this tank. With the airflow wide open, you do get a very slight restriction. However, I preferred to close the airflow just about quarter way. With the airflow positioned like this, I received a nice restrictive lung hit. I did not notice a huge bump in flavor, but it was just slightly better like this. I did get a warmer vape though by closing off the airflow a bit. The airflow control is quite stiff. Not too stiff, where it is difficult to adjust, but you do have to use some force to adjust it. This can be seen as a con, but honestly I prefer it this way rather than it being too loose. When closing the airflow down a bit, I did notice that the drip tip would get a bit hot. So sometimes I would just vape this tank wide open to avoid this issue. I think if I changed the drip tip it could have resolved this issue. Speaking about the drip tip, it really is comfortable to use. I know for sure some vapers may not like the design of this drip tip, but I personally like it. Thankfully, like said previously, you can easily change it to a preferred 510 drip tip. Keep in mind though, some 510 drip tips may not look the greatest due to the design of the drip tip area. Filling this tank is a breeze. The top fill design of this tank is flawless in my opinion. However, in some cases when you do close the top fill section, small amounts of e-liquid would squeeze out since there is e-liquid around the inner parts of the top fill section. 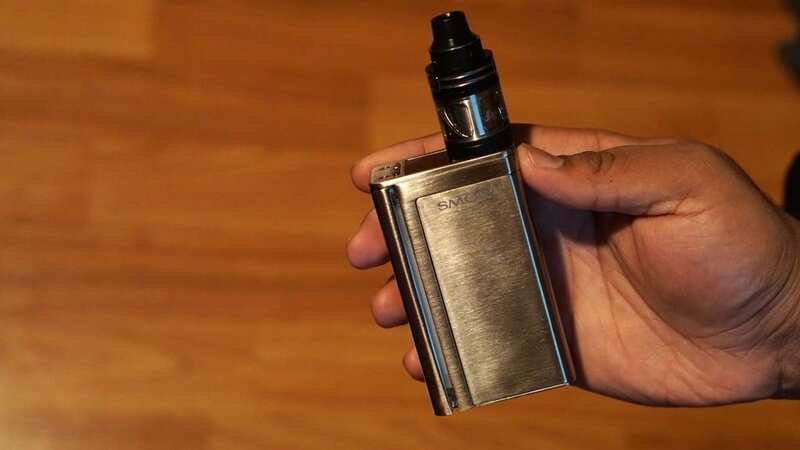 The amount of e-liquid is very minimal and you can easily wipe it with your fingers or with a tissue. This is not really a huge con, but still worth mentioning. Also, it is worth mentioning that I experienced zero leaking with this tank. Of course, this is to be expected since it does feature a top airflow design, but it is still worth mentioning. Honestly, the only way I think you could make this tank leak is if you wick this tank wrong. This tank does have a 5.2ml e-liquid capacity, but just like any other RTA it can easily go through e-juice fast. I literally vaped out the entire tank in just under an hour when chain vaping with the previously mentioned build and wattage range. So this is definitely something to keep in mind if you are interested in this tank. Overall, the performance of the OBS Engine RTA is incredible. However, there are still some cons to be mentioned about this tank, which is what is going to be covered next! Honestly, it was hard to pinpoint some cons to this RTA as there are hardly any real cons and some are just subjective. However, the first con that I do want to mention is that the drip tip would get hot at higher wattages. This issue was resolved when opening up the airflow. Also, changing the 510 drip tip could have solved this issue as well. Regardless, this is something that is worth mentioning. The next con to be mentioned is also very minor, which is that small amounts of e-liquid would come out when closing the top fill section. 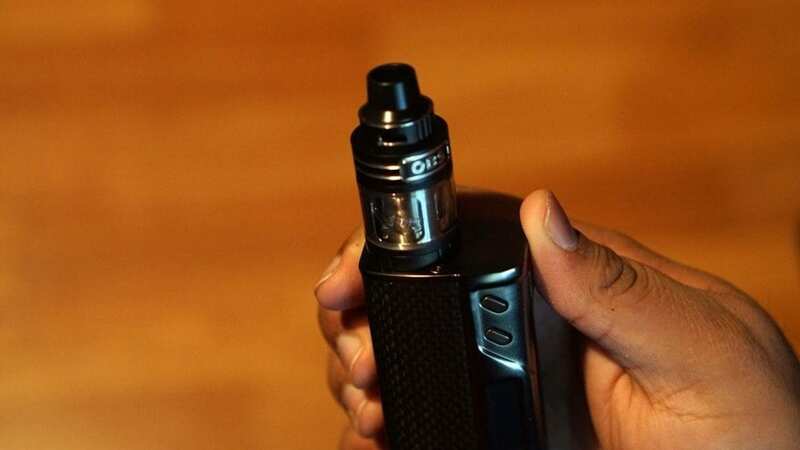 Like stated previously, the amount of e-liquid is very minimal, and would only happen when refilling the tank. A subjective con is the drip tip. Yes you can use your own 510 drip tips, but some people may not like the drip tip that is included. Also, some 510 drip tips may not look too great due to the design of the 510 drip tip area. The next subjective con is that this RTA can go through e-liquid pretty fast. Like stated previously, this is to be expected with most RTAs or Subohm Tanks, so it is not the biggest con. However, I do think it is worth mentioning. If you are looking for a tank that does not go through e-liquid quick, then this may not be a tank for you. This of course can be due to the build you have in this tank, like my previously mentioned Clapton build. Overall, there is not too many cons to this RTA. The performance of this RTA is outstanding, and with hardly any cons, it really is one of the best RTAs available, which leads me into the next section, my conclusion! In conclusion, the OBS Engine RTA is an amazing atomizer. The performance is incredible, and the flavor is really impressive. Liked stated previously, there really isn’t too many cons to mention with this one. This tank is easy to build, and wicking it is pretty easy as well. This tank just keeps up with wicking even at higher wattages. I was never worried about encountering a dry hit, and each vape gave excellent flavor. Not to mention, the vapor production is also excellent. By no means is this tank a cloud chasing RTA, but it will certainly produce a satisfying amount of vapor for most vapers! The airflow is silky smooth, and with it closed off slightly, it provides me with a nice restrictive lung hit. Honestly, I was worried that this tank may be too airy for me, but to my surprised it was just perfect. Even having the airflow wide open, the flavor was incredible, which is something you cannot say with every tank. I do love bottom airflow tanks, but the OBS Engine RTA made me love top airflow tanks even more. With leaking nonexistent with this tank due to its design, you never have to worry about it when traveling and having this tank in your pocket or purse. All in all, the OBS Engine RTA is an atomizer that is hard not to recommend. Honestly, this is one of the best RTAs of this year thus far, and may be our number one pick for this year! If you are looking for a great RTA that offer incredible flavor, and solid vapor production, then the OBS Engine RTA is definitely a tank we highly recommend. Hopefully this review has helped you with picking out your next atomizer! If you have any questions or comment, like always feel free to leave them down below in the comments section! Thanks for reading! I have had quite a few OBS products and have had no problems with all of them. My first one was the OBS VCT tank and still vape with it even now. Great review, I had been wondering about this RTA and now feel better about purchasing one, the 5.2 ml capacity surprised me after you mentioned how small it was, so that is a huge pro in my books. These 2.0ml’s, I would not even look at because of how much a person would be filling one. Keep up with the nice reviews Steve. Very well done !! Thanks! Glad you liked the review! I was surprised also by how much e-liquid capacity this tank has, certainly a huge pro for it. I love all my OBS tanks, I’ve had no issues with any of them either. I wish they had a single coil option. My wife doesn’t need the power of dual coils. Yeah, it would have been nice if it did. Most RTAs that come out are dual coil only or at least have a ceramic block to make it a single coil. There’s a few good options though for single coil RTAs, but not nearly as many as dual coil.